Authors: Juna A. Kollmeier, Gail Zasowski, Hans-Walter Rix, et al. Astronomers are not strangers to sky surveys. 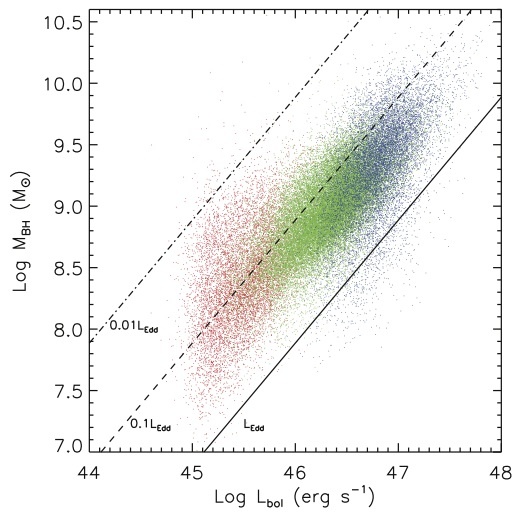 Among the tens of sky surveys, the Sloan Digital Sky Survey (SDSS) is probably the king of them all (see this bite for a historical overview), having been in operation since 2000, with WISE and ROSAT chasing its tail for being truly all-sky. However, all surveys to date, both full- and partial-sky, have been imaging surveys. There is no yet a full-sky spectroscopic survey — at least not until SDSS-V.
SDSS-V is an all-sky spectroscopic survey planned for 2020 after the end of the currently ongoing SDSS-IV eBOSS survey. It will conduct multi-object spectroscopy of around six million sources in both the optical and near-infrared bands, pioneering the age of panoptic spectroscopy. Things get better than that: it will ride the recent waves in time domain science by taking spectra of one million sources at multiple epochs. For its last selling point, SDSS-V will also carry out the largest integral-field spectroscopy (IFS) mapping of the sky — a contiguous sky area of 3000 deg2 in contrast to the current ~0.5 deg2. Figure 1 summarizes the science and operation concepts behind SDSS-V. There are three science programs at the heart of SDSS-V: the Milky Way Mapper, the Black Hole Mapper, and the Local Volume Mapper. The Milky Way Mapper will tackle the uncertain areas in galaxy formation physics by utilizing the Milky Way as a model organism. To do this, it will measure the properties of millions of stars (such as mass, age, chemical composition, and internal structure) in our Galaxy, focusing on the plane of the disk and the bulge where most stars lie. The program will also target tens of thousands of multiple-body systems to study stellar multiplicity and their environmental dependence. Due to the ubiquitous presence of dust in the Galactic disk, observations will be carried in the near-infrared as dust is practically transparent at these wavelengths. Figure 2 shows a comparison of the target density for SDSS-V and SDSS-IV. The Black Hole Mapper program aims to test various quasar models with large samples of precise measurements. Using the method of reverberation mapping, it will measure black hole masses of thousands of quasars, a factor of 25 increase in the sample of black hole masses, and to measure the spectral variability of tens of thousands of quasars to further constrain quasar models. The program will also help advance our understanding of the X-ray sky by identifying the optical counterparts for the upcoming eROSITA X-ray survey. Both the Milky Way and Black Hole Mappers will reuse current SDSS instruments. The infrared spectrograph used for the SDSS APOGEE survey and the SDSS BOSS optical spectrograph will be repurposed for the Milky Way and Black Hole Mapper, respectively. 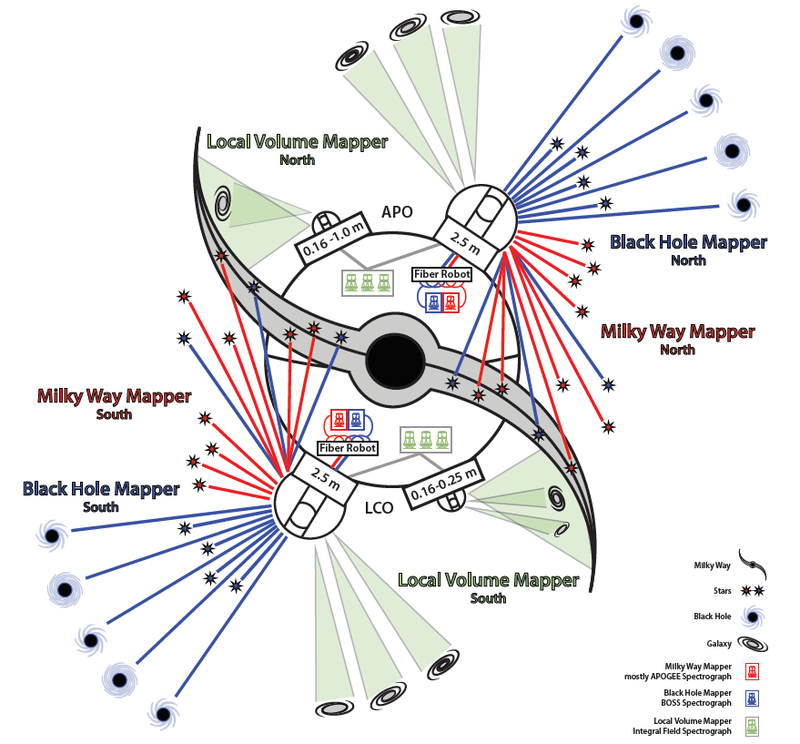 On the other hand, new infrastructure will be used for the Local Volume Mapper, an ambitious program to map the interstellar medium (ISM) of local group galaxies in a wide range of resolutions to resolve star formation structures. It aims to investigate ISM and star formation physics, with an eye to dig at the physical origins of various empirical stellar-ISM correlations. To produce its ISM map, the program will conduct integral field spectroscopy across 3000 deg2 of the sky. Figure 3 shows the range of spatial scales for the Local Volume Mapper. As touched upon earlier, SDSS-V will take advantage of many of its current technology. Nevertheless, to achieve its high target densities, we will have to bid goodbyes to the plug plate system that is so idiosyncratic to SDSS and say hello to a suite of robotic fiber positioners. The survey will be carried out in both hemispheres, with identical instruments housed at the Apache Point and Las Campanas Observatories. In the future landscape of sky surveys, SDSS-V will carve out a unique survey space by being the only all-sky, multi-epoch, and multi-band spectroscopic survey. Rather than competing with future surveys like TESS and Gaia, it will help multiply their science, as well as serve as an important model towards a spectroscopic counterpart to LSST. So heads up, fellow astronomers! The 2020 landscape of astronomy promises to be exciting. Why are most molecular clouds not gravitationally bound? How do we estimate black hole masses (and what happens if we get them wrong)? Hypervelocity stars: what are they running from? Can you tell a sibling from a doppelganger?